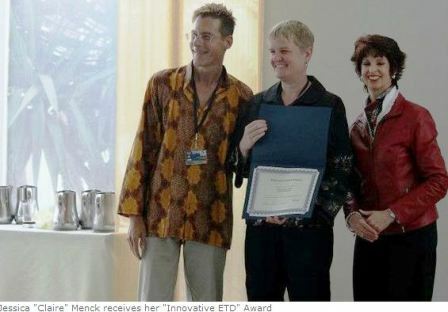 Dr. Menck [Center] receives here Innovative ETD Award from the Networked Digital Library of Theses and Dissertations NDLTD at their annual conference, 2012 in Peru. Image : http://www.ndltd.org/events_and_awards/awards/ndltd-etd-awards-2012-acceptances . Award Acceptance speech above. Menck, Jessica Claire, "Recipes of Resolve: Food and Meaning in Post-Diluvian New Orleans" (2012). Dissertations & Theses. 5.